A group of mutant assassins called the Marauders make a terrifying first appearance in Uncanny X-Men 210 (1986) in a story crossover called “Mutant Massacre”. True to the story’s name the Marauders full on massacre a group of mutants known as the Morlocks. The event is captured in Uncanny X-Men, X-Factor, New Mutants, Daredevil, Power Pack and Thor comics as various heroes battle the vicious Marauders and the bodies stack up on both sides. The “Mutant Massacre” event is notable for a whole slew of reasons. First it was one of the first major crossover events that impacted multiple titles. Previous events like DC’s Crisis on Infinity Earths and Marvel’s Secret Wars featured many heroes but the stories themselves were self-contained and only featured loose tie ins to the ongoing titles (Spider-Man’s Black suit). Prior to “Mutant Massacre” individual comic titles were mostly self contained and rarely did an event from one impact another. There were team ups and guest appearances but rarely with true effect. The cross over comic event also proved to be very popular and afterwards has become something of a staple of Marvel and DC. Many comic fans myself included think that the major cross over events are done too much by the big 2. That said it is hard to blame the big 2 because these events have proven to be highly financially successful. Comic fans buy them and buy a lot of them. 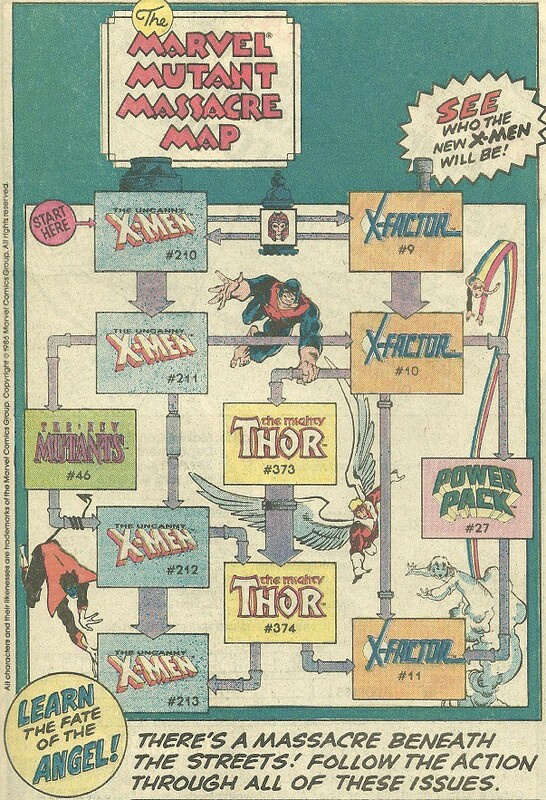 My own opinion is that the interconnected film/TV universes being built by Marvel and DC owe much of their story telling architecture to “Mutant Massacre”. One funny Note: Writers at the time found writing the crossover very difficult and many thought (hoped) it would be the last one….whoops. Pandora’s box was opened and no way was the cross over event going back in the box. Beyond the business and art of writing comics the story had a massive impact on the characters themselves beginning with a slew of casualties. As far as comic stories go this one features quite a few casualties. All but a few of the Morlocks are killed. Morlock Casualties include but are not limited to: Annalee, Piper, Berzerker, Blowhard, Cybelle, Scaleface, Tommy, Zeek. Hundreds of other nameless Morlocks are shown being killed. X-Factor member Angel is crucified by Marauders he is saved and does survive. His wounds are bad enough that his wings are eventually amputated. This of course sets Angel on the course of eventually gaining new metal wings from Apocalypse and becoming Archangel. Wolverine has his first on panel encounter with his arch-nemesis Sabretooth. Likewise X-Men members Colossus, Shadowcat and Nightcrawler are badly wounded but survive. Many Marauders themselves also die in the attack but their deaths quickly prove inconsequential (Even for a comic book) as clones of them replace the originals. Now the BIG QUESTION – Why do the Marauders attack the Morlocks in the first place? What makes the Marauders who are a group of mutants brutally assault another group of mutants who they seemingly have zero connection with. Perhaps, the most amusing thing about the “Mutant Massacre” story is that the motivation of the Marauders is never mentioned……..not even once. Whatever motivation Claremont had in mind likely was altered by the time it was finally explained approximately a decade later. The only thing that is revealed is that Sabretooth mentions that the Marauders work for someone called Sinister who can abide wildcards like Morlocks. The 2nd reason is the reason provided in later comics. Mister Sinister goes after a group called the Mutates created by one of his apprentices named John Sublime. He pulls his forces back when he learns that the Mutates can not reproduce. It seems that Mister Sinister only worry was that the Mutates would continue and contaminate his own work. Mister Sinister seemed to see the Morlock's in the same fashion as the Mutates only they were worse because they could reproduce. 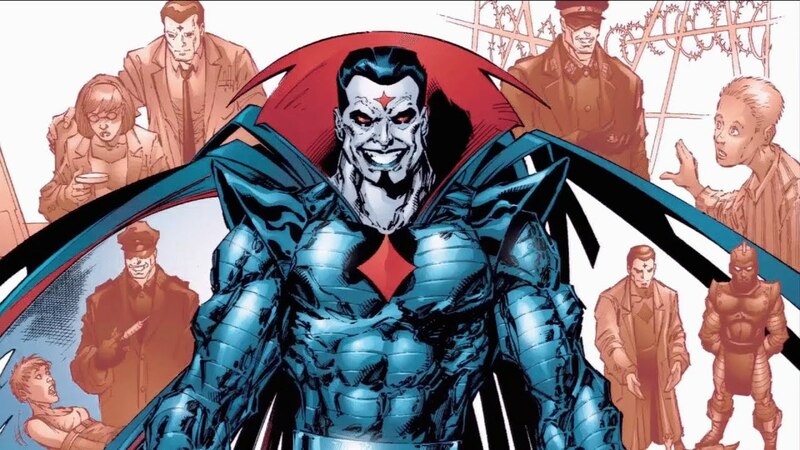 It further revealed that the Morlocks themselves were the creation of another Mister Sinister apprentice, Dark Beast from the Age of Apocalypse story line. Apparently, Dark Beast traveled between times at one point and creates the Morlock's as a kind of science experiment. 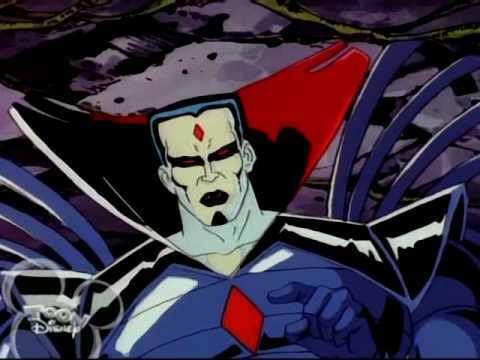 Mister Sinister creates the Maruader's seemingly for the purpose of executing these rogue strands of his work. Its pretty cold reasoning but that is why they call him Sinister.